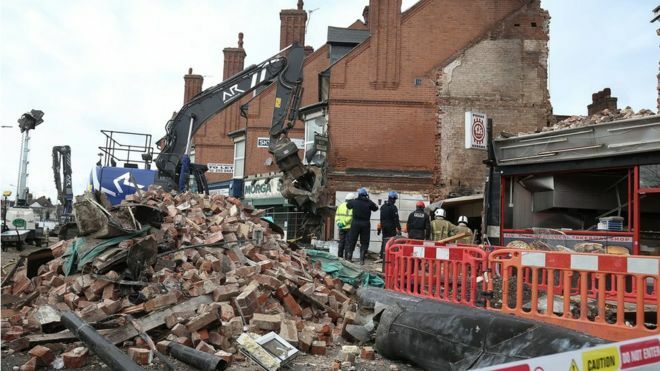 Leicester explosion- Suspects in Court- Another MAJOR TWIST in story! Three men have appeared in court charged with the manslaughter of five people after allegedly starting a fire at a shop using PETROL. Arkan Ali 37, Hawkar Hassan 32, and Aram Kurd 33, who was the shopkeeper of the premises, were arrested after a massive explosion destroyed a Polish supermarket and a two-storey flat on Hinckley Road on 25 February killing 5 and injuring many more. They appeared this afternoon at Leicester magistrates court under a heavily armed police presence to face charges of manslaughter and arson with intent to endanger life. Ali is from Oldham, Hassan is of no fixed abode, and Kurd is from Leicester. During proceedings they looked straight ahead, emotionless, requiring the services of a translator. They spoke only to confirm their names, ages and addresses during the 30-minute hearing. On Sunday someone in their late 40's from East Anglia was also arrested on suspicion of manslaughter. Two men also from East Anglia were detained on Friday in relation to the case but have since been released whilst under investigation. So far those who have lost their lives in the blast have been named as Shane Rajoobeer 18, Sean Rajoobeer 17, Leah Beth Reek 18, who was Shane’s girlfriend and Viktorija Ljevleva, 22. The fifth person is believed to have been Mary, the Mother of Brother's Sean and Sean. Since we have started reporting on this case it was initially said that it was a Gas Explosion and that any other suggestion was plain racism, it was then reported that a massive concealed basement was found and that apparently an illegal distillery of Vodka and Gin there caused the explosion. Read: "Breaking- RAF Called in to drop Air Supplies, Guess Where?!"